Lowdown: This unlikely superhero gets his powers from being tiny. At the risk of stating the obvious, if there is one thing a comic based movie should be is fun. Clearly, a lot of the comics movie interpretations we have seen over the years fail at that, but Ant-Man certainly doesn’t. 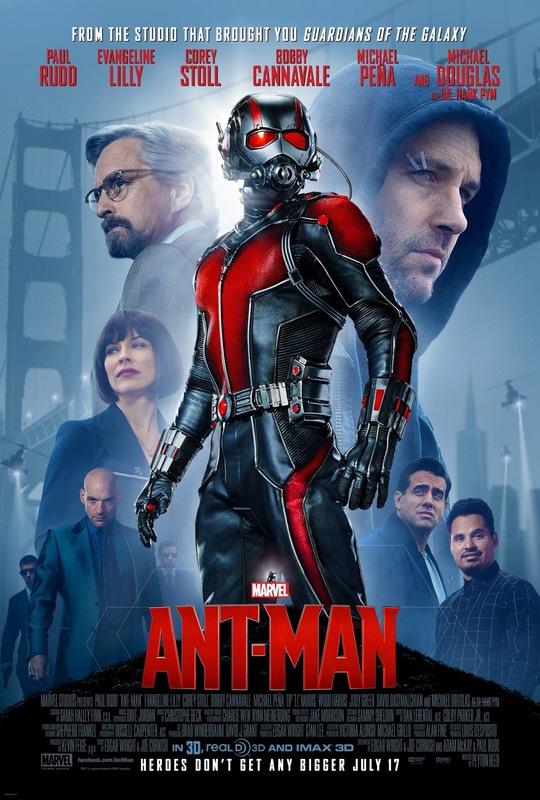 For Ant-Man is not a movie that claims to shake the very foundations of cinema; it is simply a fun movie. Works for me! This latest piece in the Marvel puzzle stars Paul Rudd as our unlikely hero. His character is a criminal, sure, but a Robin Hood type criminal, so we can excuse him and accept him as our goody for the next two hours. As nice a guy as he is, employment is a rather painful affair for our hero, so in order to be able to continue seeing the daughter he loves (now living with ex + ex new boyfriend cop) his only choice of income is to revive his burglary career. Only that he robs the wrong guy – an inventor/scientist (Michael Douglas) who now seeks our hero’s help in securing the world from the clutches of the company he once established, now controlled by his evil son in law (Corey Stoll, of House of Cards fame). What is this evil? It’s the ability to shrink stuff to ant size, thus enabling soldiers to infiltrate unseen and rule the world, Hydra style. How are they going to fight this evil? By fighting fire with fire, thus creating our superhero Ant-Man. Oh, and he can also call on the support of ants while he’s tiny. Because, you know, ants. And who is our romantic interest / token female? It’s Evangeline Lilly (aka the female elf from the recent crap Hobbit trilogy). She portrays the scientist’s daughter and the baddy’s ex. The result: Fun. And there’s even a tank in there! Pretty much the only negative I can throw in the mix is the forced attempt to glue this movie into the Avengers ongoing mega-story. It clearly detracts Ant-Man’s plot development, and it is even more clearly done offhand; the only Avenger bothering to show up is Falcon (read: the cheapest Avenger to bring along). It’s just silly and badly done. Overall: Fine unassuming entertainment for a nice evening. And there’s even a tank! 3.5 out of 5 crabs.